We live in a deeply divided world. I’m not talking about political, racial, gender, or ethnic divisions; I’m talking about normal people, and Morning People. While the former look forward to weekends in order to sleep in, catch up on their rest, and stay up past their bedtimes, the latter are a different breed entirely. They wake up at ridiculous hours starting with sixes and even fives, and more insidiously, they expect that the rest of us do, too. So, when my email correspondent yesterday afternoon queried “I can be there tomorrow at 8:30. Does that work for you?” every fiber of my being recoiled. I am not a Morning Person. I enjoy Saturday, because it gives me the opportunity to wake up at the crack of noon and stay up entirely too late. If I see the sun rising on a Saturday, it usually means I have stayed up way too late on Friday. Somehow, though, I just could not turn down this meeting. To recapitulate my recent, lengthy blog post in two words: I’m moving. Since the move is cross-country, most of my furniture and a good portion of my stuff needs to be sold. That’s easy if you have a garage, tough if you’re an apartment-dweller like me. So, I turned to that trusted standby, Craigslist. Dozens upon dozens of items are listed in my frantic quest to reduce my clutter and generate some cash for the move. 1. Some people are flaky. They set up times to meet with you and no-show. They email asking for more pics and information, and then disappear without even a “thanks but no thanks” message. 2. Some people are greedy. They offer far less than your posted price, usually after they’ve already taken up your time by setting up an appointment and coming into your home. 3. Some people are rude. They write short, terse emails with grammar so incomprehensible it feels like physical assault. Seriously, my eyes HURT after reading some of their queries and missives. No matter how polite and professional I try to make my correspondence, some people cannot seem to muster better writing than your average eight year old. 4. The damn thing is HEAVY. I distastefully remember spending over an hour moving it into this apartment; getting frustrated by every corner, doorway, and staircase; sweating and aching from its bulk and weight; pledging to burn it rather than ever move it again. Whoever buys my couch is going to need help getting it out, and I don’t want to help them, not for the $200 I’m asking for the item. My billing rate at work is $300 per hour, and that’s for a job that I like. In my view, fair compensation for moving that couch again is about $2,000. 5. I have two cats, and a wife who has been away most of the year for her job. For that reason, the area behind the couch, under the couch, and between the couch cushions is riddled with cat fur, crumbs, wrappers, cat food, the lost treasure of the ancient Inca, loose change, and additional bric-a-brac that has accumulated over the last four years. 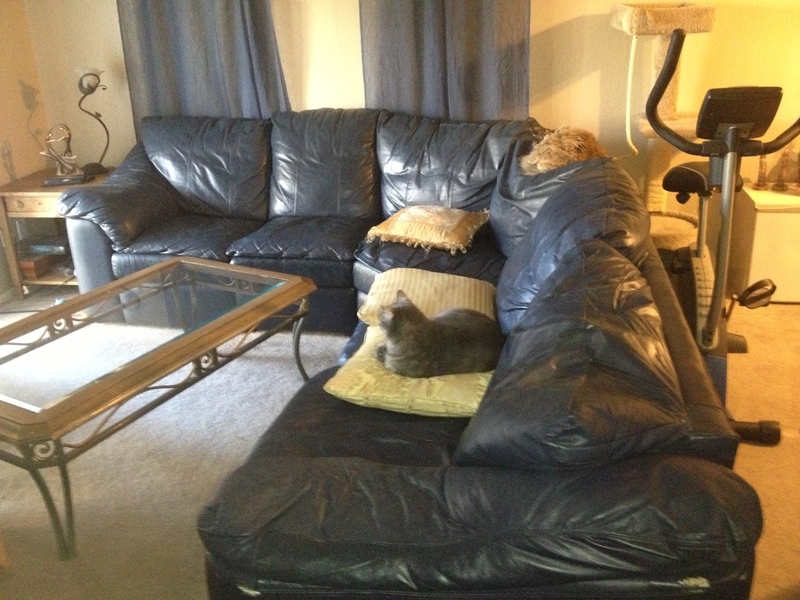 Thoroughly cleaning these areas would require moving the couch, and see objection #4. To summarize, I was not looking forward to selling the couch, and when I received an instant-response to my posting, I saw an opportunity to get a hard task completed. Skip to: Saturday morning, approximately one hour ago. The phone rings promptly at 8:30: my prospective buyer had arrived. I throw on some clothes and go to the parking lot to show him the way. The first person I see in the parking lot is an older man in a Mini. I avoid eye contact. This could go horribly, horribly wrong. Then, thankfully, I see the gentleman who is, in fact, my prospective buyer. He brought his roommate, and not one, but two large trucks. They are both about my age, and built like linebackers. Seriously, each one of them was built like two of me put together. I gladly show them in. Their purchase decision is made in the pure, magical way that only guys can stereotypically shop. They sit down on the couch, pat the cushions next to them, then stand up. They sit down on the other side of the couch, pat the cushions on either side, and stand back up. “Okay,” one says, and hands me two one hundred dollar bills without discussion. They then proceed to methodically and quickly disassemble the couch and move it out like so many pieces of styrofoam. Having already resigned myself to having some part in the moving process, I pick up two of the cushions; that was my only role in the relocation of my furniture. This was by far the best Craigslist sale I could have imagined. My fears proved unfounded. I should probably go now, and vacuum the empty spot on which my couch once stood. Over the holidays, Ashley and I decided to relocate to New York. This decision has been a long time in the making. As most of you know, Ashley has a master’s degree in 3-D Character Animation, and in the fall of 2011, she was hired as a freelance animator by a company based in Manhattan. While the job security was not great- she would find out each week if she was “booked” to work the following week- it provided her with her first real experience in her chosen field. Since that time, she has been renting a room in Flushing, and while we have traveled back and forth to spend time together, we have been effectively “bi-coastal” for nearly a year and a half. This past February, I sat for the New York Bar Exam, and was admitted to their bar in October. The exam itself was quite simple compared to California’s mandatory hazing ritual, but the admissions process was frustrating enough to warrant a future blog post, which will be forthcoming when the mood again strikes me. We have been investigating whether to relocate, or to have Ashley find a position on the West Coast, since that time. Finally, last month, two independent developments led us to a decision. First, Ashley was offered a contract, and negotiated terms better than a professional negotiator (i.e. her husband) could have accomplished. The significance of this is that she now has job security, along with benefits. Second, we spent the holidays together in Kentucky, and realized that our current situation is untenable. I love being with Ashley; it is one of the countless reasons I married her. Remaining bi-coastal is no longer an option. For those reasons, today I notified my firm that I will be resigning my position, and leaving California at the end of January. While I do not yet have a position secured, I am confident that once I am there, in person, for interviews and networking, an opportunity will present itself. To be sure, I have mixed feelings about moving, though I am confident I am making the right choice for our family. I love California. The culture here is, in my opinion, the best in the country. We are diverse, accepting, progressive, and forward-thinking. The politics here suit me. More, California is beautiful. We have nearly every climate represented in our one state. I am also a big fan of seasons, which is why I live in an area that skips the crummy ones. We have snow, if you care to drive to it, but it never imposes itself where we live. I will also miss the beautiful hiking trails, particularly those in the Auburn area, along the Northern Fork of the American River. If you live here and haven’t visited them, you’re missing out. More than the state itself, I will miss the people here, and the wonderful friendships I have enjoyed since moving to San Rafael in 2005. My law school classmates and professors, my wonderfully unique social group in Sacramento, and the professional connections I have relied upon make this a wonderful place to live. I feel richer for having known all of you. However, I am also greatly optimistic and excited about the new opportunities and adventures that lay ahead. New York is a vibrant city, and moving to the East Coast puts us much closer to our families and childhood friends. I expect to arrive in New York about a week into February, and look forward to reconnecting with old friends, making new ones, and finding my way in the city that never sleeps. Thank you all so much for the friendship and support you have shown me over the past eight years. I will miss you.